Cotton quilt . 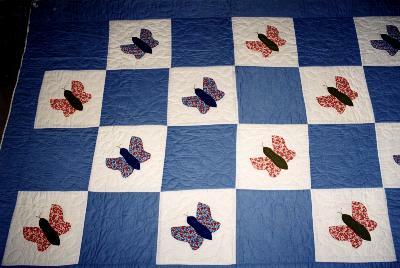 Blue squares with evry alternate square cream with an appliqued butterfly. Blue border. Completely hand quilted. Light weight padding and cotton backing . Purchased by the owner from a 'craft shop' in Indiana USA in 1967. "Both quilts were bought when living in the USA in the 1960s. Until that period I had not heard about quilts. Many friends showed me their quilts which had been handed down for generations or were made specifically for the individual. The majority had the maker and the date sewn on the quilt, in some cases conspicuously in other cases unconspicuously."